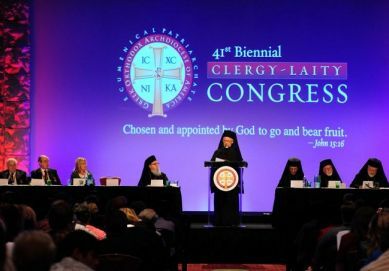 (Photo: Greek Orthodox Archdiocese of America)Archbishop Demetrios of America speaks at the 41st Biennieal Clergy-Laity Congress taking place in Phoenix, Arizona on July 2, 2012. The head of the Greek Orthodox Church in the United States called for increasing stewardship offerings, noting comparatively low giving compared with Protestants and Roman Catholics. Archbishop Demetrios of America made the comments in a keynote address on Tuesday for the 41st Biennial Clergy-Laity Congress of the Greek Orthodox Archdiocese of America taking place in Phoenix, Arizona. He said despite the "big financial progress" of people in the church "we are considerably low in our stewardship offerings to our Church." "We are way down from the average stewardship offerings in the Roman Catholic or the Protestant Churches. There is an issue here which must be carefully studied and confronted with methodical strategic planning," he said. The Archdiocese describes an Orthodox Christian Steward on its website as one who is an active participant in the life of the church, making a commitment of time, talent and financial resources, depending on personal circumstances, to support church related ministries. The call for increased giving was one of seven other calls to "bear fruit," a reference to the theme of the conference "Chosen and Appointed by God to Go and Bear Fruit," taken from a biblical passage (John 15:16). The Archbishop noted a number of problems in the world today, ranging from economic woes, social unrest, "ideological chaos and ideological apathy," global migration of people, ethical problems and religious fanaticism. "This is the world to which we have been appointed to go and bear fruit. It is a wounded world, a confused world, a fragmented world, in which we have to cultivate and offer the fruit of faith, love, healing, peace and hope," he said. Among the other examples of bearing fruit, the Archbishop also called for connecting interfaith families to the community of faith, improving religious education among the youth, communicating faith to co-workers in business, bringing to the Church people who are away from Christ, improving inter-Orthodox relationship in the U.S., and preserving the Greek language and culture. "United with Him the way the branches are integrally and essentially united to the vine, we will be able to go and bear fruit, much fruit, even in a barren land, even under the worst circumstances," he said. "Let us not waste time. Let us go now. The field is open, wide open by the grace of God, Who was, is and will forever be with us."